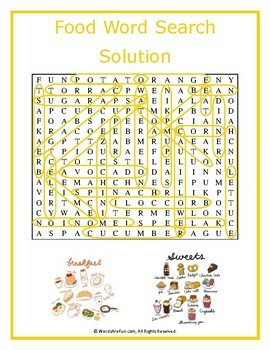 A word search puzzle featuring words associated with food. 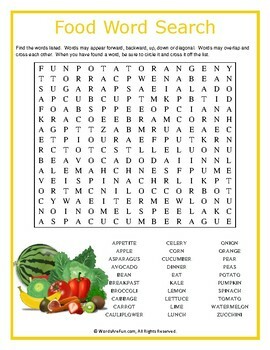 This word search will make your mouth water and run straight to the kitchen! Use this sheet as part of your teaching curriculum, a treat for early finishers or just for fun. Word List: Appetite, Apple Asparagus, Avocado, Bean, Breakfast, Broccoli, Cabbage, Carrot, Cauliflower, Celery, Corn, Cucumber, Dinner, Eat, Kale, Lemon, Lettuce, Lime, Lunch, Onion, Orange, Pear, Peas, Potato, Pumpkin, Spinach, Tomato, Watermelon, Zucchini.